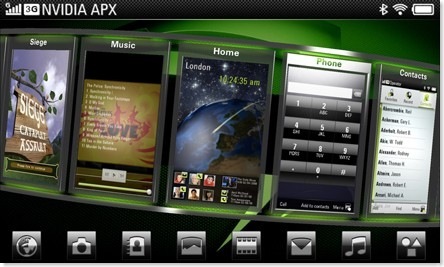 Recently announced, at the Mobile World Congress 2008, the APX 2500 is the first processor from NVIDIA aimed at the next generation of smartphones. Based on an ARM chip (the ARM11 MP core running at up to 750Mhz) and combining GeForce graphics (a new ultra-low power (ULP) GeForce core) with nPower Technology, the APX 2500 provides support for Windows CE and Windows Mobile. Software developers can exploit the power of the device through a set of software drivers that enable the development of rich media applications with compelling user interfaces. An implementation of OpenKODE is provided that allows applications to be developed to take full advantage of the graphics and video acceleration available and provide sophisticated 3D user interfaces. Other supported graphics standards include Open GL ES 2.0 and Microsoft Direct 3D Mobile.